Because there are so many more fabulous felines who have made their mere existence into a viral sensation on the 'Net, today’s Cat Friday presents a redux edition of this post, featuring several more furry and famous kitties that we feel are just as cute and “squeee”-worthy as the first batch! Pusheen – a chubby, roly-poly, grey-striped kitty who runs a cutesy Tumblr that's a cat lover's dream – supposedly is based on a real-life cat with a similar appearance. 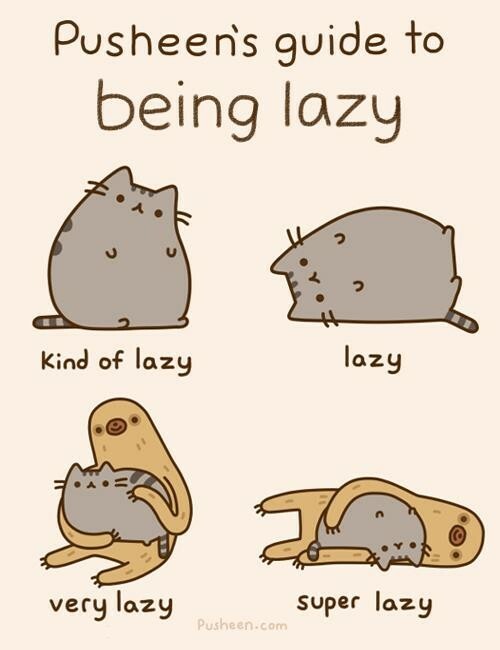 Yet, Pusheen prefers to only present herself in a simple, marshmallow-y sketch pad generated version of herself. You might have seen the food-loving feline’s bouncy animated gifs circulated around Twitter and Facebook, but if you haven’t actually check out her blog pusheen.com we suggest you get on that ASAP. After you do, you can even share your love of Pusheen by donning items from her apparel line, or by decorating your living room sofa with Pusheen plushies, and other accessories. Next we present to you a somewhat more local celebri-cat. 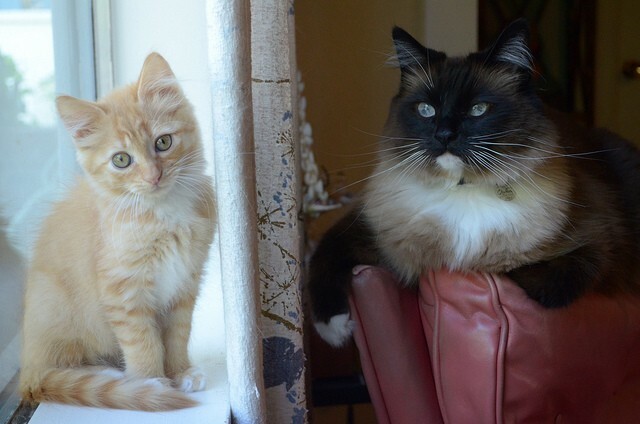 Charlene Butterbean is the regal and floofy matriarch of the wards of the Itty Bitty Kitty Committee – a blog that chronicles the antics of kittens fostered by Tacoma resident Laurie Cinotto. Charlene is often featured on the IBKC blog, and takes her duty as kitten caretaker (bathing, monitoring, etc.) very seriously. Not only is the blog filled to the brim with adorable and artistic photos and video clips of the foster kittens – who all receive very well thought out first and last names – but the stories of each litters’ arrival, departure, and updates once they leave the nest. If you live on the West Side, check out this too-cute blog because Laurie only adopts out to pre-screened locals (she ensures that every kitten goes only to the best home possible) and also does a lot of fundraising for the Tacoma/Pierce County Humane Society. Also, look for the humane society’s vans driving around – Charlene is proudly featured on the side. By now you should be just as crazy about LIL BUB as this author is (I don my Lil Bub tank proudly and would give an arm and a leg to meet her! 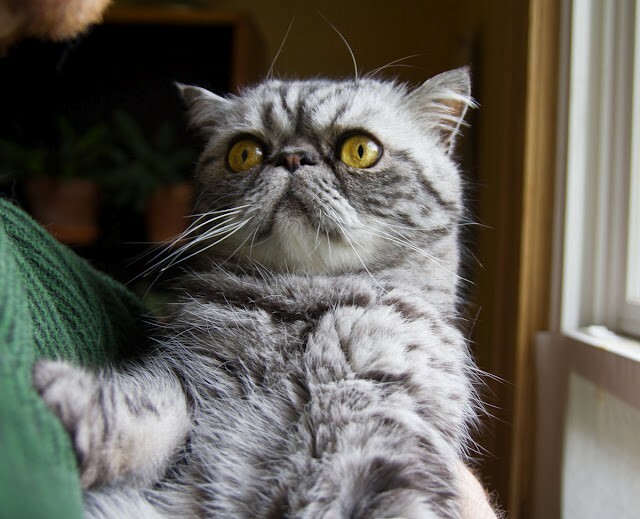 ), but do you know that Bub has a not-so-secret crush on a Persian-mix named Smoosh? It’s true, she confesses her undying love for Smoosh quite a bit (check this out). Anyhow, the bright-yellow eyed kitty’s Tumblr is just as addicting as any other cute cat site, but maybe just a tad funnier because of Smooth’s perma-pissed off look in just abut every pic. Oh – and you can buy Smoosh tees and tanks, too. Readers of this blog are going to be the most fashionable cat lovers ever thanks to these cats and their effortless hipness. Probably the most spoiled and richest cat in the world (well, besides that one in Italy who a while back was reportedly left $13 million dollars in his deceased owner’s will) is Choupette, the feline companion of fashion designer Karl Lagerfeld –you know the guy behind Chanel, Fendi, and his own couture label. Choupette was apparently “stolen” by Lagerfeld from a model friend who’d asked him to cat-sit the fluffly little white kitten last Christmas. However, probably few would have expected the tiny fluff to steal the tough-looking designer’s heart. Now, Choupette is making her own headlines – but how could she not? She has been said to have two of her own personal maids, eats meals at the table with Lagerfeld, and has her own iPad to play with. 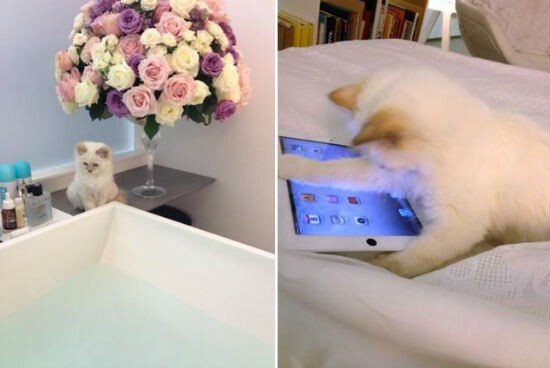 It’s been reported that the kitties maids are also instructed to chronicle her daily activities in a diary so that Lagerfeld can catch up with his little pet when away. Follow this fashion-savvy feline – who we can’t doubt will inspire some couture fashion – on Twitter at @ChoupettesDiary. 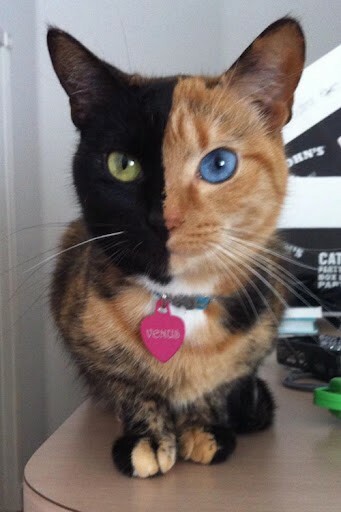 In the past couple weeks, a unique cat named Venus has been getting loads of media attention for her two-toned face that has two distinct colors on each side split down the middle in an almost straight line. One side is black with a green eye, and the other is orange with a blue eye. Venus appeared on the Today Show last week, and during the segment her owners told the host that they came to be parents of the now famous kitty after seeing a photo a friend of theirs had posted of Venus as a kitten at a dairy farm where she was born. Many have speculated that Venus is a chimera – which means that she has the genetic material from two different fertilized eggs, basically two embryos would have fused together during development in the womb. This scientific phenomenon is extremely rare, but Venus’s mom said on national TV that she hasn’t had the cat genetically tested and doesn’t plan to. They just want their cute little tortoiseshell to live a healthy, happy and carefree life.